Chrystal Jessie Macmillan lived from 13 June 1872 to 21 September 1937. She was a barrister and a campaigner for women's rights. The wider picture in Scotland at the time is set out in our Historical Timeline. 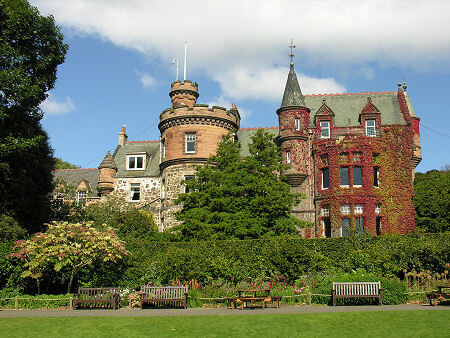 Chrystal Macmillan was the daughter of John Macmillan, an Edinburgh tea merchant, and was brought up alongside eight brothers in the family home of Corstorphine Hill House. Today the family home forms part of Edinburgh Zoo. From the age of 16 she attended St Leonards School for Girls in St Andrews. In 1892 she became an early female student at the University of Edinburgh, graduating in 1896 as the university's first female science graduate. She went on to complete an MA in mental and moral philosophy and then became a lawyer. In 1908 she became the first female advocate to appear before the House of Lords, when she sought to make the case that female university graduates should be given the right to vote in elections for University seats in parliamentary elections. She was unsuccessful, but her appearance gained a great deal of publicity and a considerable amount of public support. She went on to appear before a number of committees and enquiries, promoting the interests of women on issues such as street crime and equal rights on unemployment insurance. She also campaigned against the legal requirement for women to lose their UK citizenship when marrying a foreign national. Chrystal became secretary of the International Woman Suffrage Alliance in 1913, a post she held until 1920. During the First World War she played a leading role in organising the International Congress of Women in the Hague in 1915, which sought the intervention of neutral states to bring an end to the war. After the war she took part in the International Congress of Women in Zurich in May 1919, and was then appointed as one of its delegates to the Paris Peace Conference. She returned to her legal practice after the war, and in 1924 was called to the bar. In the 1935 General Election she stood unsuccessfully as a Liberal candidate for North Edinburgh. She died in Edinburgh in 1937. This biography draws on research first published in "The Biographical Dictionary of Scottish Women".